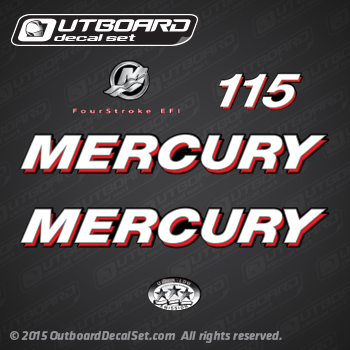 Decal set replica for 2006 Mercury 115 hp Four Stroke EFI (Electronic Fuel Injection) outboards with a matching part number 881649A06. This set include a decal version of the M logo emblem, and Emission decal. Model No: 1115F13FF, 1115F13FN, 1115F13FY, 1115F23FF, 1115F23FY, 7115F13UF, 7115F13UY. 827328T 9 (Black)(2000-2006)(75/90/115) and 827328T10 TOP COWL ASSEMBLY (Silver).